Transformative advances in drug treatments approved by the Food and Drug Administration are giving the 3.2 million Americans with chronic hepatitis C a chance for a longer, healthier life without the virus. That’s welcome news for baby boomers—who make up three of four adults with the hepatitis C virus—and millions of other Americans, many of whom don’t yet know they are infected and carriers. Hepatitis C can be cured, and today’s drug therapies are very effective and easier for patients to take, says Jeffrey S. Murray, M.D., the deputy director of the Division of Antiviral Products in FDA’s Center for Drug Evaluation and Research. Murray is an internist who specializes in infectious diseases. Hepatitis C is the most common chronic blood-borne infection in the United States. There is no vaccine for this disease, but hepatitis C can be prevented by avoiding behaviors that can spread the virus—including sharing needles, syringes or other equipment to inject drugs. The new regimens include Sovaldi (sofosbuvir), which is the first drug approved to treat certain types of hepatitis C infection without the need to co-administer interferon. In recent years, FDA has also approved three protease inhibitors—Olysio (simeprevir), Victrelis (boceprevir) and Incivek (telaprevir)—to treat chronic hepatitis C virus infection. Olysio is a protease inhibitor that blocks a specific protein the hepatitis C virus needs to replicate. The drug is a component of a combination antiviral treatment regimen. FDA provides information through a Hepatitis e-mail list, along with notices of upcoming public events, such as advisory committee meetings, and opportunities to comment on policies and issues that affect people with hepatitis B or C.
For most people, hepatitis is a silent disease until it causes substantial damage to the liver. That process may take several years, and can lead to liver failure, liver transplantation and liver cancer. 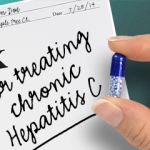 Once infected with the hepatitis C virus, nearly 8 in 10 untreated people remain infected for life, according to the Centers for Disease Control and Prevention (CDC). Three in four patients with chronic hepatitis C are baby boomers (people born from 1945 to 1965), and many became infected before the virus was identified and the blood supply was tested for the disease. That’s why it’s important for baby boomers—there are 76.4 million of them, according to the U.S. Census Bureau—to take a simple blood test for hepatitis C.